Noida : Governor of Kentucky State in USA The Honourable Matt Bevin, yesterday paid a visit to the Noida Plant of Indian flexible packaginggiantUflex Ltd which is the home to FlexFilms’ plant situated inElizabethtown, Kentucky. 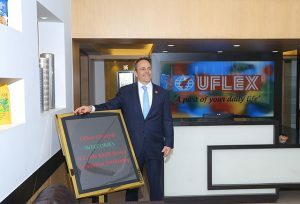 Welcomed by the senior leadership of the company,Governor Bevin was given an introduction about Uflex and its businesses following which he enjoyed a tour of theFilm Business plant. Governor Bevin interacted with the team and gained insights into the manufacturing operations and technology.